Window Cleaning London. Office & Residential. London Window Cleaners You Should Trust! Excellent Carpet Cleaning offers full window cleaning for a wide variety of window types. We also clean gutters, patios, skylights and conservatory roofs. We clean single and double windows, sash windows, French doors, small and big bay windows, garden windows, sliding doors. Along with that you also get complimentary sills and frames cleaning only if PVC. With the help of advanced water purification system, our team has managed to reduce cleaning pollution by 99%. By only using purified water we can guarantee the risk-free cleaning of your windows. This is done without introducing dangerous chemicals to the environment, your home or place of business. We use a water filtering and purification system to remove minerals, salts and other particles. The water is left a bare H2O molecule. Our water supply can come straight from the tap and feeds directly into the filtration system in our van. The clean water is then used to clean the window. We don't rely on foaming agents, detergents or other materials to clean saturated windows. The denatured water sticks to the molecules of the grime on your windows and strips them away with ease. The process takes only a few minutes, leaving your window without scratches and filth. All is done with the power of purified water. Due to the stationary nature of the filtration system, you need to provide a parking spot on the side of the building where the cleaning will take place. There must be an easy access to the window during the cleaning. Using a telescopic water-fed pole we can reach heights of up to four stories. We clean domestic and commercial properties without having to use a ladder or a rope suspensions system. With comfort and ease, our cleaners are able to clean windows, frames and sills from the ground floor to fourth-floor heights. To properly remove dirt our cleaners first clean the sills and frames of the windows. They then proceed to strip the dirt and grime away from the pains of glass on the windows. Stripping away the dirt detergent free reduced future dirt exposure. Soapy substances like detergents attract filth quicker requiring window cleaning sooner. 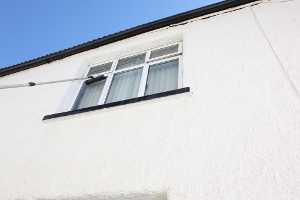 Our method offers you a long term solution that cleans and rinses the windows in one go. ExcellentCarpetCleaning is also offering interior window cleaning done with special detergents and a squeegee. To prevent dirt transfer from our cleaners to your carpets, the workers use shoe covers. They do interior window cleaning either with a ladder or on foot, depending on the accessibility of the window. Starting from the frames and sills, the windows will be cleaned spotless. If you combine interior and exterior window cleaning, you will get a discount. For the finest window cleaning in London call Excellent Carpet Cleaning on 020 3404 0500. Our staff of dedicated customer reps will be more than happy to help you with scheduling and booking. If you have any enquiries about the booking process or anything else, call us. To request a callback or to book a service use the booking form located on the booking page of the website. All our customer contact methods are free of charge and obligations. Feel free to call at any time.